Protective eyewear innovator Wiley X®, Inc. has joined Optometry Giving Sight and the World Sight Day Challenge Coalition to support important eye health initiatives and projects designed to help those who are needlessly blind or vision impaired. The lynchpin of this ongoing international campaign is World Sight Day, which this year falls on October 13. This year’s World Sight Day Challenge will focus on the need for effective, sustainable eye health initiatives for children and adolescents. The campaign will run from September 1st until October 31st and will help support vision care services being delivered around the world. The World Sight Day Challenge is a major fundraising campaign coordinated by Optometry Giving Sight designed to raise funds for projects that provide training, establish vision centers and deliver eye care services for people who are blind or vision impaired due to uncorrected refractive error – simply the need for an eye exam and a pair of glasses. The World Sight Day Challenge will feature orange people power wristbands as an easy way for patients, employees and students to make a donation and participate in fundraising activities. Wiley X is supporting these efforts by providing a financial donation to Optometry Giving Sight and launching its own employee awareness program to promote the need for better eye health and eye care initiatives at home and around the world. “Protecting people’s vision is not only our business, it’s also our passion here at Wiley X,” said Wiley X Co-Owner Myles Freeman, Jr. “We’re very pleased to have the opportunity to help raise funds for sustainable eye health projects and help raise awareness of eye health needs not just at home, but abroad. The fact that the focus of this year’s World Sight Day Challenge happens to be effective, sustainable eye health initiatives for children and adolescents strengthened our desire to help even more. This has always been an important issue to us, and a big reason behind our new Youth Force line of vision protection products designed especially for youngsters,” added Freeman. 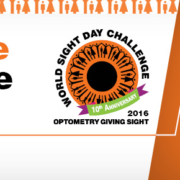 If you or your organization would like to participate in the World Sight Day Challenge, please go to:http://www.givingsight.org/giving/world-sight-day-challenge.html. Wiley X manufactures an extensive line of sunglasses offering Absolute Premium Protection for work, play, and everyday life. All adult Wiley X sunglasses meet stringent ANSI Z87.1 High Velocity and High Mass Impact Safety standards, providing OSHA-grade protection for every type of activity. Many models also carry the latest updated MIL-PRF-32432 (GL) Standard for ballistic eye protection, delivering military-grade vision protection for everyday Americans enjoying their everyday lives. This level of protection is a key reason why Wiley X has been a leading provider of vision protection to the U.S. military and law enforcement for nearly 30 years. Almost all Wiley X sunglasses are also Rx-ready using the company’s exclusive DIGIFORCE™ digital Rx lens technology, providing men, women and children with the clear vision and advanced protection they need. To learn more about Wiley X’s full line of sunglasses and what the company means by Absolute Premium Protection, visit www.wileyx.com. Or contact Wiley X at 7800 Patterson Pass Road, Livermore, CA 94550 • Telephone: (800) 776-7842.